Color block bucket tote bag. Off on a shopping spree? Meeting the girls for lunch? Visiting friends with toddlers in tow? A large and tough tote is a must-have to hold all you need for the outing. The open main compartment makes it super convenient to slip items in and out and the strong handles offer an easy carry by hand or over your shoulder option. Our tote features a classic cotton twill fabric in dark navy blue bottom with oatmeal textured top and faux leather brown handles. 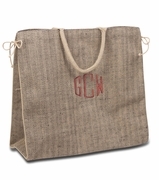 Personalize it with our new accent monogram for that extra touch of pizazz! Matching cosmetic accessory bag available search item RS-43004.